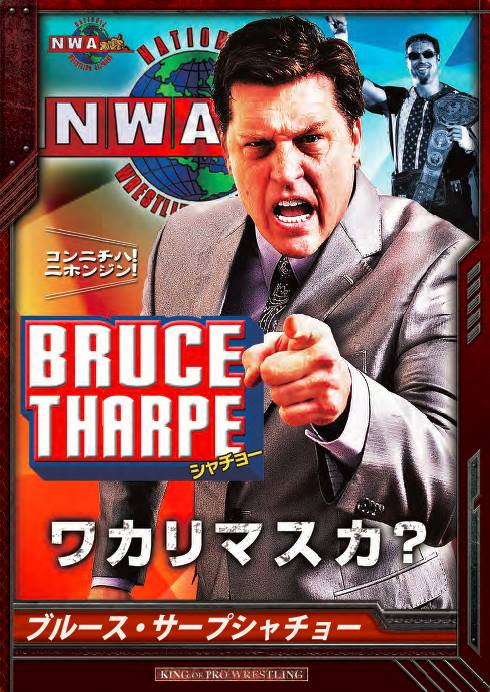 R. Bruce Tharpe became president and leader of the National Wrestling Alliance in July of 2012 to realize a particular vision that he had for a legendary wrestling institution fallen moribund. Mr. Tharpe was kind enough to detail that vision for us via a conversation conducted with the author through email in October 2014. When you think about your first childhood experiences with professional wrestling, what images do you see in your mind and what emotions do you feel? My first childhood experiences with professional wrestling date back to early childhood, as I was literally born into the wrestling profession. I was born in 1961, and – at the time – my father worked as the television ring announcer for Championship Wrestling from Florida, promoted by Cowboy Luttrall and booked by Eddie Graham. I would go to the wrestling matches with my father as a little boy, and since he was the ring announcer, all the wrestlers sort of adopted me. I distinctly recall being held by guys like Lou Thesz, Eddie Graham, Sam Steamboat, Joe Scarpa (before he became Chief Jay Strongbow) and others when I was just a little kid. You’ve worked as a referee in Florida during an influential and successful period. How might have that context affected your learning curve? Were there specific moments when you learned more from a particular mistake or failure? Every aspect of wrestling that I have been involved in has had a learning curve. If you ever think you know all there is to know – you’re sunk. You always have to keep learning. In Florida, I started out selling Cokes at the Ft. Homer Hesterly Armory while my Dad was the announcer. I saw all the legendary wrestlers pass through Florida during that era. All of them. I remember the first time Andre the Giant appeared in Tampa in the early 70’s. That was amazing. I also worked in the wrestling office, and became a ring announcer myself. I participated in the weekly television tapings for about five years. I did some television commentary with Gordon Solie, and worked under some great bookers like Dusty Rhodes, Wahoo McDaniel, JJ Dillon, Jody Hamilton, Dory Funk Jr. and others – all before I even started refereeing. As a referee, you are actually in the ring with the wrestlers – close up – and the knowledge and understanding you gain in that element takes you a different level. So, it’s important in wrestling, as it is in any business, to have as much experience in as many different areas as you can. How did that environment shape your view of professional wrestling and how it can be successfully promoted? Who influences your overall perspective on the sport? I believe that pro wrestling should be presented in a more serious fashion – as opposed to a comedy act. That’s what I learned from working in Florida in the “old days” to currently working in New Japan Pro Wrestling right now. The bottom line is that today’s wrestling product – whether it be in New Japan Pro Wrestling or the National Wrestling Alliance – is that this is as real as it gets. While other promotions pride themselves on presenting “sports entertainment” and trumpet the “predetermined aspects” of their product – when you see NWA wrestling you see credible, exciting, athletic, competitive matches in which wrestlers demonstrate tremendous athleticism – and risk serious injury every time they step into the ring. We bring a level of realism and legitimacy to the sport that fans have been seeking for a long time. How do you view the current landscape of professional wrestling? What would you point to and say, “I support that approach.”? Where might you see the opportunity to innovate? I would point to the NWA New Japan strong style as the wrestling style of the future: it’s exciting, athletic, and believable. We believe that this is – no doubt – the wrestling style that will prove most successful and, by fans, most preferred. As you’ve alluded to, the NWA has reestablished its connection with New Japan Pro Wrestling. To what extent does this connection exist? How interested in additional international partnerships are you? How does furthering international partnerships further the goal of the NWA? The idea behind the NWA is to recognize a unified World Heavyweight Wrestling Champion, and the NWA World Champ is the ONLY true wrestling champion who travels the world meeting – and beating – the top contenders around the globe – to prove that he is the number one wrestler in the world today. Not sports entertainment. Professional wrestling – and there is a HUGE difference. The NWA has traveled to Japan and Taiwan in order to prove that our wrestlers are better and we will continue to do that around the world. Consequently – promoters who join us internationally will have the benefit of booking top NWA wrestlers and their talent base will improve as result. Who are some of the current stars of the NWA that excite you? Whom do you see as important to the goals of the NWA? Based on your history and contributions to the business, it would be hard to argue that you don’t have a deep understanding of and respect for professional wrestling. But, for the sake of the record, simply put, what does the National Wrestling Alliance mean to you? The National Wrestling Alliance is a sacred organization that dates back to 1946 and is a throwback to some of the earliest wrestlers ever. To me – the NWA is like the Smithsonian Institute of Wrestling, and it is an organization that must be preserved and restored to its original lustre and respect. In the wake of NJPW’s Wrestle Kingdom 9 and their new North American show on AXS TV, Mr. Tharpe looks like one of the smartest Americans in the wrestling world, as many points he made last fall have come to fruition. To say that this bodes well for the future of the National Wrestling Alliance could prove to be a vast understatement. — Daniel Stusiak is a freelance writer from SoDak. You can find him on Twitter, Instagram, and Facebook.